A weekend returned and resting from ditch camp. Perhaps resting is not the right word. Moving cows (bringing the girls to a boy), cleaning cabins, clothes and selves, restocking and repacking. I’m slack on finding time to catch up with correspondence and writing. And when I finally do sit down to write, the words and stories overwhelm and I don’t know where to begin. There seems to be so much. Summers, rich and full. As they must be. Fast and furious and fleeting in the high country. I must begin with the practical. An explanation of ditch camp for those of you who have no idea what I’m referring to. For those who know, please excuse the redundancy. I’ll share something new with you next time. Ditch camp is about the three of us living in a little thin wall tent with a wood stove, a welcome upgrade from five years ago when we began camped out under a tarp. It is about being tired and sore and dirty at the end of the day, earning our rest, our silence, our sleep. It is about sitting wordlessly together with a simple meal of Hamburger Helper, listening. To each other. To the steam of the coffee on the fire. The sound of the creek. Birds. The horses contented exhales as they graze on the endless pasture of the Divide. The wind through the trees baring their soul as the needles fall and soften the ground below with a silvery brown blanket. Ditch camp is about days spent with hand tools and horse power. A team of three. One family, close, together, comfortable in the wild world. And horses and dog and wildlife. Shovels and picks, drags and slips. Rebuilding low banks. Cleaning out debris and sediment washed in during the spring run. Repairing damage and improving flow. And my favorite part. Clearing and felling trees with the old crosscut saw, one pair taking turns as the third person stands guard with ax in hand, watching the waving of the top of the tree to tell us it is ready to fall. The forced and powerful rhythm of the back and forth metal on wood, torsos to and fro, vigorous breathing in and out, sawdust and shavings gathering in reward at the base of the tree as the cut gets deeper and deeper. 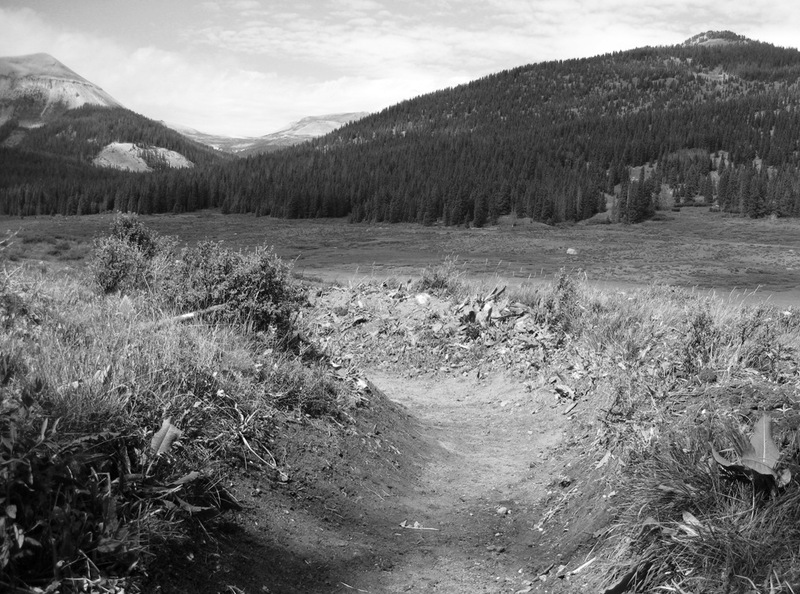 And on the most practical level, ditch camp is about maintaining a transcontinental ditch deep in the Weminuche Wilderness for a private company that owns the water rights. An old ditch built long ago bringing water from a creek that flows to the west of the Divide over a mile to the east. Pretty simple. They don’t know we see it as the romantic adventure it is, and remain grateful for the hard work we do. As for the rest, and there is so much more to share with you, I must wait for another day. “Rich – in the ways that matter.” Sweet wisdom we can all take a good look at, Kim, thank you. Heading back to ditch camp this morning. “See” you at the end of the week. Have a good one. Better yet, make it good. Rich and full. It is fascinating that such a ditch exists – thank you for sharing. I am glad that it provides such satisfying work for you all. If you don’t mind a few questions, how wide and deep is the ditch? What sort of a gradient does it have? How well does it survive the flow of water each year? What is the water used for? Sorry to burden you with questions! Julian, I must say, most folks aren’t that interested in the technical aspects, so I tend to leave them out, but leave it to an engineer (mind you, a poetic and horseman of an engineer) to consider such things! The ditch is over a mile long, on average about 6 feet wide and three feet deep, and has the capacity to flow 13 cubic feet per second when “in priority.” To guess, it drops only about 300 feet in 7000 feet. The water is used for both farming in the San Luis Valley and household use. The ditch was originally built probably around 1940 and survives remarkably well with our minimal maintenance. I’m glad to “talk ditch” with you Julian, it is fascinating! That is interesting, Gin, thank you. It is quite something to consider that people dug that ditch seventy years ago, having thought of what to do with the water and how to lay out the work. I wonder what traces there are of them, what records? I must admit that, if I could appear back in 1940 for a day, I’d have taken a ride on the old Rio Grande Southern Railroad rather than look at a ditch being built. There again, of the two only the ditch still survives. I don’t need time travel to see it. Over here we have a few Roman ditches still existing. The drainage ditch in the north part of the small town where I live was built by the Romans two thousand years ago. I think that there is still one somewhere in the southwest supplying water to farms. Oh Julian, Bob double checked and believes it is more like a drop of only 100 feet for the 7000 foot length. Very gradual. A hundred feet or so in a mile sounds reasonable – not too much erosion that way. I did become curious and find Weminuche Wilderness on Google satellite. It’s snow-shrouded in the image, which sounds quite like how you describe it for over half the year! Then I found a hiking map of the wilderness, and that shows two ditches across the continental divide, both feeding towards the Rio Grande reservoir. The sheer altitude amazes me. I used to live at two thousand feet, rode up to six thousand most weeks and occasionally to the highest peak at seven thousand. You live higher than that all the time. What a wonderful wild area. I’ll look out for some information on the ditches around here. The terrain isn’t wild, however they have some interest even in a scenically mundane place. Yes, Julian, sounds like you found our ditch! Do you have access to Google Earth? If so, you might enjoy checking the area out that way – you can get a greater idea of how wild and rugged it really is. I imagine what your ditches may lack in wild life surrounding, they may make up in wild tales, and a fascinating history.